Rules lesson: If your idea of an appeal starts with the pitcher on the mound, you're doing it wrong and opening up a can of worms known as "losing the chance to appeal." Furthermore, a team that waits for the standard pitcher-to-base appeal loses out on the possibility of beating out a scoring time play. Yes, today's lesson is about strategy, appeals, and two types of appeal plays (Delayed and Real-Time). Runner Bradley fails to retouch third base. In 2013, we discussed The Retouch Rule 7.08(d): A Game of Acting and Knowing. That post covers runner's retouch responsibilities, while this one will cover appeals. 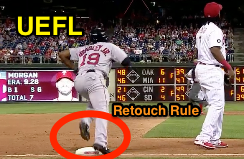 To recap, although the modern number for this rule has changed from 7.08(d) to 5.09(b)(5), the language is still the same, and states that a runner is out when, "He fails to retouch his base after a fair or foul ball is legally caught before he, or his base, is tagged by a fielder. He shall not be called out for failure to retouch his base after the first following pitch, or any play or attempted play. This is an appeal play." Rule 5.09(b)(5)/5.09(c)(1) is the "he left early" play, generally relating to the runner's base of origin. Rule 5.06(b)(1) governs baserunning and states, "In advancing, a runner shall touch first, second, third and home base in order. If forced to return, he shall retouch all bases in reverse order, unless the ball is dead." Appealable: Failure to return to first base. Rule 5.09(c)(2) states that a runner is out on appeal when, "With the ball in play, while advancing or returning to a base, he fails to touch each base in order before he, or a missed base, is tagged." Other appeal plays include overrunning/oversliding first base and failing to return to the base immediately, and failing to touch home base while making no attempt to return to that base (Rules 5.09(c)(3) and 5.09(c)(4), respectively). Recall Rule 5.09(c) Comment: "Time is not out when an appeal is being made" (except in NFHS ball and NCAA softball, for instance, where dead ball appeals are allowed, in addition to live ball appeals). Under OBR, appeals must occur during live ball action. Furthermore, appeals themselves are time limited: "Any appeal under this rule must be made before the next pitch, or any play or attempted play...If the defensive team on its first appeal errs, a request for a second appeal on the same runner at the same base shall not be allowed by the umpire." There are two types of live ball appeal plays—Delayed and "Real-Time"—and the time limit provision of the appeal rule always applies to the Delayed variety, also known as the pitcher-steps-off-the-mound (or "Standard") appeal, which occurs when an appeal originates with the pitcher, with the ball on the mound. Problems (for the defense) with the Delayed Appeal: Let's begin with a rule: "If a pitcher balks when making an appeal, such act shall be a play," which causes the defense to lose its opportunity to appeal. If the pitcher throws the ball into the stands while trying to throw to a base, or the pitcher makes a play on another runner, the defense forfeits the opportunity to appeal (e.g., the pitcher plans to appeal that a scoring runner left third base early. Another runner, R1, decides to try and steal second while the pitcher has the ball, and the pitcher throws to second base to attempt a play on R1. As a result, the defense loses its ability to appeal whether R3 left third base early). At this rate, why even risk giving the pitcher the ball? Related: Leisurely Appeal with Runner on Proves Costly for China [Appeal with a runner stealing]. Related: Rule 7.10: How a Runner is Out on Appeal [Appeal at 3rd base with R2 trying to steal 3rd]. Real-Time appeals can prevent mistakes. The "Real-Time Appeal": When an appeal is made during the play in which the rules infraction occurred (e.g., before the ball is thrown to the pitcher and play is reset), the time limit provision of the appeals rule is relaxed: Because other action may still occur during the continuation of a standard batted ball (or thrown ball) play, an attempted play on another runner, for instance, does not immediately cause the defense to lose its chance to appeal, as it does in a Delayed appeal. Also—and this goes without saying—appealing "in real-time" means that the pitcher won't balk and, thus, cost the defense the opportunity to appeal. The MLB Umpire Manual refers to the Real-Time appeal's relaxed timeframe as, "the continuous action created by and following the batted [or thrown, or pitched] ball." Continuous action basically suspends the standard appeal time limit regarding plays or attempted plays until such action comes to a complete stop. For instance, if, with R1 and R2, a wild pitch or pickoff attempt results in both runners attempting to achieve two additional bases, and, the defense attempts to throw R1 out at third base as R2 crosses home plate, the throw to third base on R1 is deemed to be part of "continuous action." Therefore, if, after the play comes to a natural conclusion (or even prior to this point), the defense wishes to appeal at third base that lead runner R2 failed to touch third, that appeal is authorized since any throws on R1 would be deemed part of the continuous action created by the batted/thrown/pitched ball. MLBUM looks for a "definite break in the original continuous action" before ruling that the "play or attempted play" time limit has begun: a Delayed appeal, as described above, qualifies as such a "definite break." A Real-Time appeal, as described in the preceding paragraph, does not. The rule is also important to know because appeal plays, with two out, are time plays—if the inning's third out is recorded before another runner touches home plate, the run will not score. A Delayed appeal on a third-party baserunner has absolutely no chance of beating the scoring runner's touch of home plate due to the delay's definite break, but a Real-Time appeal retains that (remote) possibility. Appeals aren't force plays (unless, naturally, the runner's failure to achieve the next base would, itself, be a force out, e.g., a bases-loaded situation where the runner from first fails to touch second base). 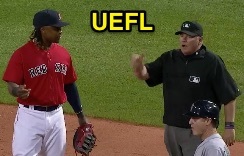 Related: UEFL Series: Baseball Rules in the Real World (Fourth Out) [Appeals are time plays]. 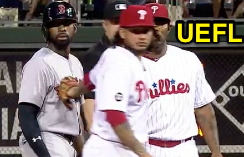 On Wednesday, the Phillies attempted such an appeal when, with one out and one on (R2), Red Sox batter Sandy Leon flied out to Phillies first baseman Tommy Joseph as Boston baserunner R2 Jackie Bradley, Jr., running with the pitch, had to reverse course and retreat back to second base before the Phillies could retire him based on the base-of-origin retouch Rule 5.09(b)(5). Appeals can be Delayed or Real-Time. In his haste to return, Bradley, who had reached, touched and passed third base, failed to retouch third base on his way back to second, which drew the attention of Phillies shortstop Freddy Galvis, who called for the ball and tagged Bradley while he stood on second base, appealing to 3B Umpire Stu Scheurwater for a ruling, resulting in the inning's third out as Scheurwater called Bradley out for failing to retouch third base on appeal, pursuant to Rule 5.09(c)(2). Had this play occurred with baserunner R3 on third base, and had he tagged up and attempted to score, HP Umpire Jim Reynolds would have had to rule on whether the runner touched home plate before the out was recorded on Bradley on appeal. U1 Wendelstedt rules on a Real-Time appeal. In 2016, Boston first baseman Hanley Ramirez made such a "Real-Time" appeal to retire Mariners batter-runner Nelson Cruz after both players missed first base; Ramirez followed Cruz up the right field foul line as Cruz legally overran first base, and tagged him, appealing to 1B Umpire Hunter Wendelstedt that Cruz failed to touch first base, as in OBR 5.09(c)(2). After verifying the appeal, Wendelstedt declared Cruz out for failing to touch the base. Had there been a runner on third base who advanced to home plate during this play, the run would not count: "A run is not scored if the runner advances to home base during a play in which the third out is made (1) by the batter-runner before he touches first base; (2) by any runner being forced out; or (3) by a preceding runner who is declared out because he failed to touch one of the bases" (Rule 5.08(a) EXCEPTION). Conclusion: When on defense, always opt for a Real-Time appeal, when possible. The potential for error during a Delayed appeal may be low, but is nearly non-existent in Real-Time. As an umpire, understand which type of appeal the defense is attempting so as to properly enforce rules-prescribed time limits and regulations. Determine when continuous action has ended and a definite break has occurred. Furthermore, when entertaining a potential Real-Time appeal, always verbally or otherwise confirm the defense's actual intent to appeal. If the player fails to initiate some manner of communication to express their intent to appeal, then it is not a valid appeal play and should not be ruled upon as such. If the player holds the ball while touching a base/player and saying something of the sort, "the runner didn't touch the base," this is a valid appeal and should be ruled on as such.